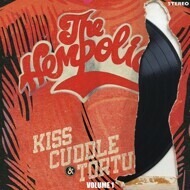 ‘Kiss, Cuddle & Torture Volume 1’ is the debut album from London outfit The Hempolics. If variety is the spice of life then this album embodies it, taking a heavy reggae roots influence and mashing it with hip hop, electro, soul, rock and pop to provide an antidote to the attention-deficit generation. Some bands talk an ‘all killer no filler’ album, The Hempolics walk it. Over years of recording top international talent The Hempolics enigmatic leader, Grippa Laybourne, has been carefully honing his own masterpiece and selecting a gang armed and dangerous enough to execute it. Alongside mainstay vocalists Nubiya, Dandelion and Harry come other top talent including Maxi Jazz and Paolo Nutini. Singles off the album have already picked up massive support on BBC Radio. With a unique modern yet vintage sound and a serious punk DIY ethic this working class band are destined to have the rich kids and performance school drones dominating the industry quaking in their wake. This is the sound of the underdog coming to bite.